This is the poster from 2018’s Veteran’s Day Parade. The route is along Fairhaven Avenue from Walnut to Regent Street in downtown Burlington. Enjoy the events before and after the 11 AM parade. free coffee & cookies at the Burlington Chamber of Commerce. 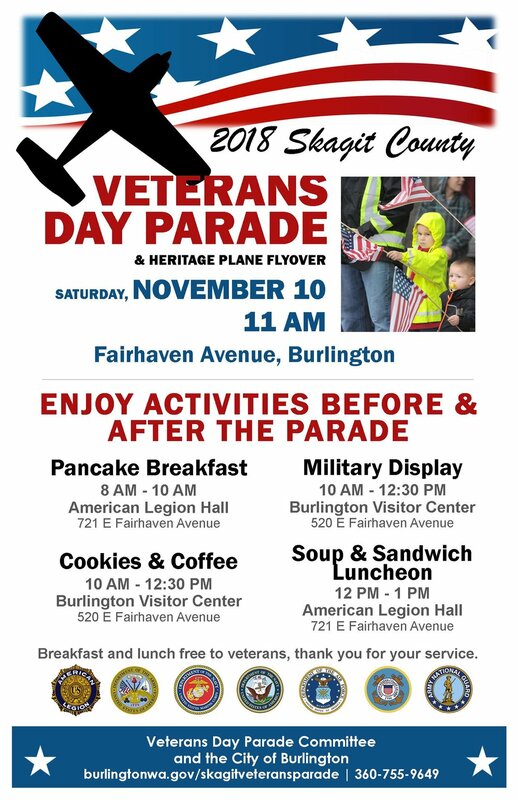 Join Skagit County in honoring our veterans and their families and community of support for their service. Interesting in Walking or Riding in the Parade? Would you or your community group like to be a part of the parade? Turn in your parade entry formby October 1, 2018 and call 360-755-9649 Burlington Parks & Recreation with any questions.